Welcome to Off-Campus Student Affairs! The Office of Off-Campus Student Affairs (OCSA) extends community building and learning beyond the campus of the George Washington University by providing resources, services, and programs designed to assist and guide students in navigating the process of moving from residential living on campus to independent living in the surrounding community. Our office is committed to educating students on how to become active and responsible members in their surrounding communities. As the semester ends we know that some of you will be moving out of your off-campus residence or thinking about sub-leasing your residence over the break. Click below and you'll find some helpful tips for navigating this process successfully and tips if your residence will remain vacant over the break. Get some rest and have a safe summer. Questions on How to Dispose of Something in DC? There's an App for That! It’s not always easy remembering which items are recyclable, which items require scheduling a bulk pick-up, and which items are considered household hazardous waste. To take the guesswork out of waste disposal and recycling, the Department of Public Works (DPW) has created a new web app that allows residents to type in almost any item they can think of, after which they will be provided with information on how that item should be properly disposed of, recycled, reused or composted in the District. *DPW collects large, bulky items by appointment from residential households that receive DPW trash collection service. To make an appointment, please call the Mayor's Citywide Call Center at 311 or visit www.311.dc.gov. GW's Off-Campus Housing website and our Guide to Living Off-Campus are two excellent resources to start your search and find housing options. The GW's Off-Campus Housing website help you find listings for both undergraduate and graduate students, as well as looking for roommates. Whether you are an undergraduate moving off-campus, a new transfer student, or a graduate student moving to DC for the first time, the Guide to Living Off-Campus is written with your needs in mind. One of the great benefits of attending The George Washington University is our location in the Foggy Bottom/West End and Foxhall communities. We enjoy numerous cultural activities, excellent shopping, restaurants, and entertainment opportunities. As a member of the GW, Foggy Bottom/West End and Foxhall communities, we all have a responsibility to be good citizens and good neighbors. 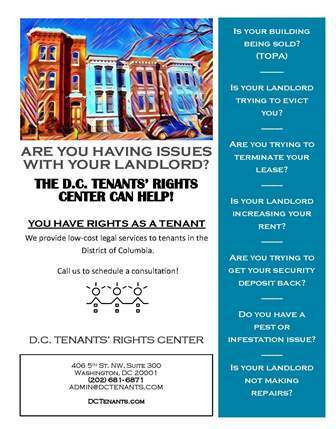 The primary goal of this annual required training is to enable you to understand your rights and responsibilities as a citizen of the Foggy Bottom and Washington, DC communities. With this knowledge you can contribute to creating an environment that embraces the concept of community and respect. Depending on your familiarity with the content and learning style, the training will take you approximately 5­-10 minutes to complete. Click on the class to start the training. Be A Good Neighbor, Be Aware of the Trash and Recycling Guidelines in the District of Columbia!